With stands inside Mitsuwa Marketplace in Irvine and Costa Mesa, the import is a cult favorite, and for good reason. 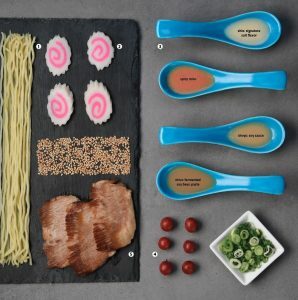 Made from wheat flour and kansui (alkaline water), wavy ramen noodles cling and absorb the flavorful broth, allowing you to enjoy the soup with every slurp. Thin slices of steamed fish cake with a texture akin to crabmeat are emblematic of the Naruto whirlpools in Japan. The pink spiral toppings add a touch of whimsy to every bowl. All of Santouka’s broths are pork-based, but other ramen shops might use chicken, beef, or even vegetables as a base. The long-simmered broth is then seasoned with salt, soy sauce, or miso paste. A dime-size pickled plum is the cherry on top of Santouka’s ramen bowls. The tart, acidic flavor is surprisingly potent; we don’t recommend eating it in one bite. Decadent, roasted slices of this rare cut of meat are served a la carte with the Tokusen Toroniku bowl. This offering is unique to Santouka, as most shops solely offer pork chashu (marinated pork belly). 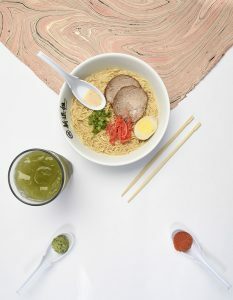 Don’t miss the melt-in-your-mouth, charred chashu pork or the vegan ramen at this sleek, modern joint. Just make sure to beat the lunch and dinner rush, as seating is limited. How did you get into ramen? I grew up eating my mom’s shoyu and miso ramen in Fukushima, Japan. We lived in the countryside, so my family and I would drive two to three hours to try other ramen. I came here as a student. I couldn’t speak English, and I didn’t have any money, but I wanted to open my own ramen shop. 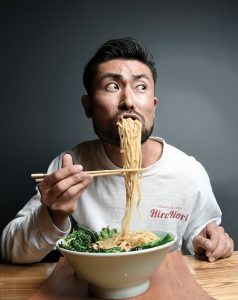 I went from being a dishwasher at one restaurant to being the manager and head chef of Silverlake Ramen in L.A.
What’s it like to open your own shop in O.C.? We have a factory space that I manage with my partner (Tadanori Akasaka) where we make our noodles. If there’s anything I want to change, I just make a call and it changes. I’m always at the store listening to customers and improving our recipe. 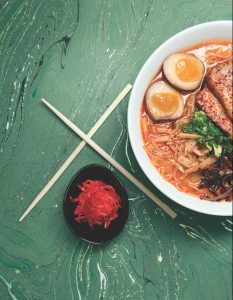 Have it your way with checkbox-style ordering and countless topping options such as green chile butter bombs, spicy miso, and flavored eggs. Come for the wide array of vegan-based broths including the “Vegan Ecstasy,” which has the same creamy flavor of a tonkotsu (bone) broth, the result of using pan- and deep-fried veggies as a base. Brave the “Motto Red,” an extra spicy broth at this Westminster hot spot that uses dried Thai chile peppers to elevate the heat. 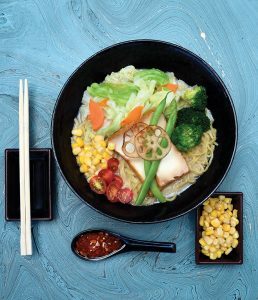 A robust menu with a variety of soup bases and appetizers, including pan-fried gyoza, makes this Costa Mesa noodle bar a local favorite. Get the seafood bowl at this Fountain Valley shop. Served with jumbo shrimp, mussels, and lobster, the spicy miso broth is balanced with cilantro and lime. 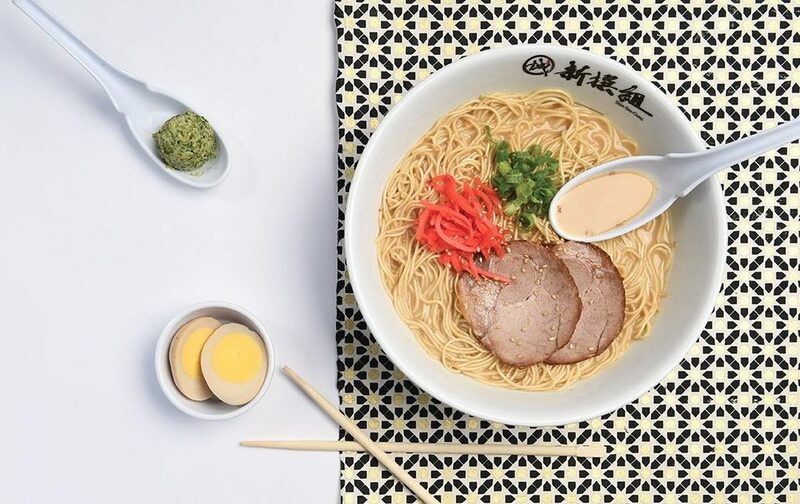 Try the Tonkotsu Black at this Orange noodle house. It’s the signature bowl featuring a 10-hour-marinated pork bone broth and black garlic oil. Cozy up at this noodle stand in Santa Ana’s McFadden Public Market. If you crave heat, get the spicy tonkotsu broth or ask for the house chile pepper oil on the side. Choose from pork- and chicken-based broths and satisfy your late-night craving at this college town hang in Fullerton, open until 1 a.m.